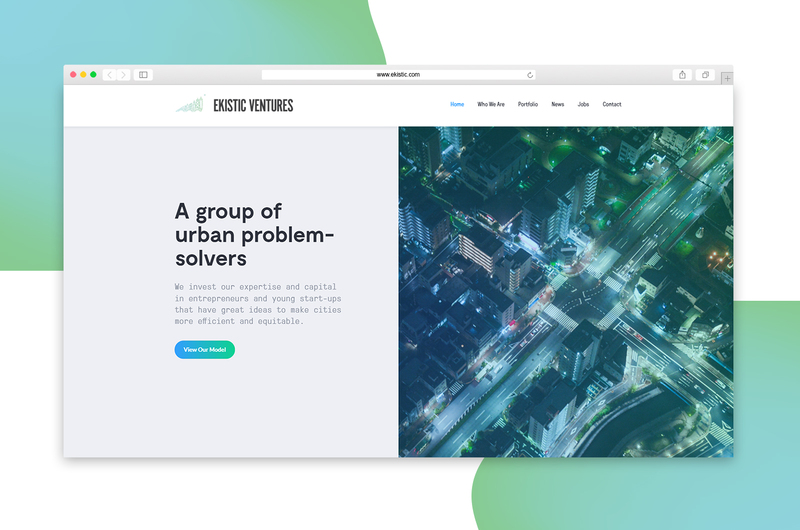 Creative direction for the Ekistic Ventures website started with looking at the competitive landscape in Chicago and across the nation. Venture capital firms tend to split themselves between two directions—showcasing either their portfolio companies or themselves as focal points. With Ekistic Ventures, we wanted to blend that space into a cohesive brand presence. Ekistic Ventures is led by incredible people with a fascinating mission that separates themselves in the venture market. Ekistic Ventures is a company about the bright futures for young companies, all centered around one strong mission—to make cities better. The Ekistic Ventures brand was only a logo and two colors at the time of the web redesign. We identified early on that the old site was light on brand assets, and needed a more unique brand presence. Through structure, we designed an environment where people can learn about both the Ekistic Ventures brand and their portfolio companies. 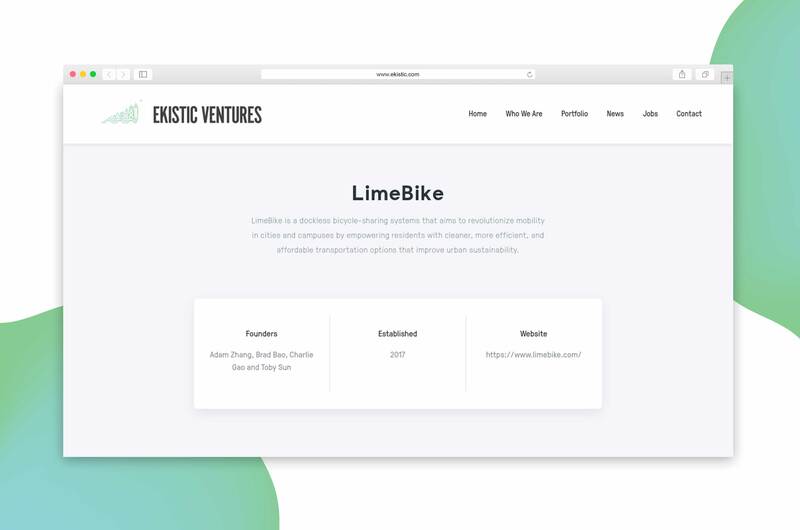 With the new website we wanted to pronounce that young and growing spirit of all the companies under the Ekistic Ventures portfolio. We found a way to inherit meaning and functionality from their two primary colors by using them for their two primary types of investments; partnerships being green and investments being blue. Once that was established we were able to freely use color with intent. One of the most visually influential parts of the site is our choice in type. We chose two sans-serif families that reflect the spirit and the technology oriented mission of the company. One of the challenges of this project was its living portfolio of companies. Their portfolio companies change in structure and leadership, and they get featured in plenty of news. We developed a content management system for Ekistic Ventures that allows them to update and display all of this information easily. 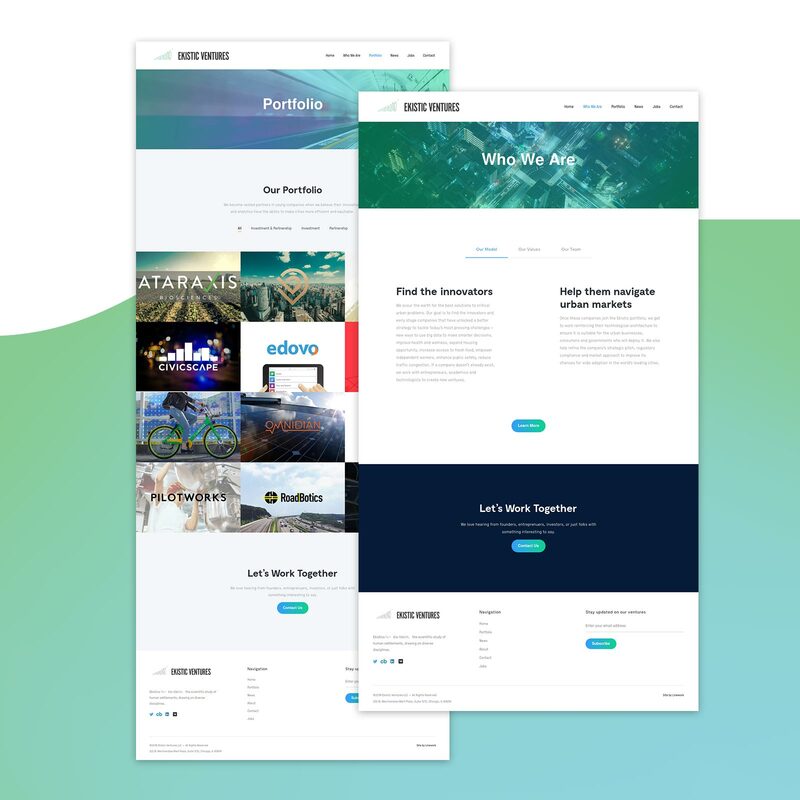 Each portfolio company has a dedicated page where we give visitors information and all news on each company.